This powerful, gentle work restores balance in the craniosacral system which effects all systems of the body. Using a delicate palpation, this work re-balances the body, mind and spirit of the being. Visionary cst is a heart-based approach grounded in ancient wisdom. The work enhances the function of the nerves, membranes, tissues, fluids and bones. It effects all systems of the body. Using a delicate energetic palpation, the practitioner supports the body, mind and spirit of the being so they can re-balance themselves. We work with them without an agenda, always for their highest good. 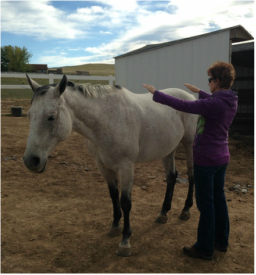 This 7 level certification program takes you through the entire body section by section so you will obtain a deep and thorough understanding of the horse from a craniosacral perspective. We’ll explore the horse-human relationship from a unique view through visionary craniosacral work. Shamanic technology is woven into the traditional cst methods. This allows us to see what is actually happening with the horse physically and emotionally in that moment and locate primary issues effecting behavior and performance. There will be a lot of hands-on work with horses as they become our master teachers. We’ll explore the speech of nature, the art of listening in expanded awareness, energetic sourcing and the interfaces in relationships and in the body. Courses build on each other and must be taken in sequence. This is the beginning of your journey where you'll explore the history and theory behind craniosacral therapy from a visionary perspective utilizing the ancient wisdom of shamanic technologies. You'll learn a solid base of equine anatomy from the cst perspective, how to feel the cranial rhythm on the horse, practical treatment protocols relating to the anatomy you learn. There will be a combination of lecture and hands-on work with horses each day. You’ll be perfecting your ability to feel the rhythm and being in expanded states of awareness, you will be learning the front end anatomy, common pathologies and a protocol specific to issues of the forelimb. Anatomy: neck, withers, forelimb, shoulder girdle, back, ribs & the hoof. You will learn about the common pathologies of the hind end relating to movement and protocols for restoring flexibility and balance. We’ll look at the skeletal structure, muscles, connective tissues/fascia and the complex pelvic girdle. Anatomy: all aspects of the hind end. We’ll look at biomechanics, movement & conformation vs. body imbalance. We’ll delve into common pathology found in the cranium due to head injuries, birth trauma, training mishaps & improper use of equipment. We’ll look at the common symptoms relating to these issues like head shaking, vision issues, excessive eye tearing, resistance to training and more. We’ll take a close look at the membranes of the brain and spinal cord and see how these effect many aspects of the horse’s life and how they can influence behavior and health. We’ll study the nervous system, dentistry and dental pathology, the power centers of the body and light work. Anatomy: sutures of the cranial bones, air sinuses, membranes, cranial nerves, the entire nervous system & unwinding of muscles. In these 2 levels we’ll explore the systems of the body and learn how to work with them to restore balance. We’ll work with the circulatory, digestive, endocrine, immune/lymphatic, reproductive, respiratory, urinary & nervous systems. We’ll go more deeply into the energetic and shamanic technologies of the work. This is an exploration of your unique gifts, working with energy, chakras, clearing, light frequencies, distance work, shamanic visioning, shamanic journey work, animal totems, stones and crystals. Ongoing private and group mentoring will be available upon request. To register for a workshop, your non-refundable deposit of $500 is due upon registration. This ensures your place in the class. If there is a last minute emergency and you can not attend the workshop, the deposit is transferable to another workshop. Balance is due in full on the first day of class. To officially register please send an email request to tracyvroom@gmail.com. If you pre-pay for the whole program there is a 10% discount. For information on monthly tuition payments, please call to discuss. Note: This option is only available if you commit to the entire program with a signed contract. The amount is based on a 12 or 24 month payment plan. Amount of payment will depend on when you begin the program. Cash, checks, credit cards, Paypal and Square are accepted. There will be a 3.2% charge for credit cards. Please call to discuss. Visionary cst is a heart-based approach grounded in ancient wisdom. The work enhances the function and health of the nerves, membranes, tissues, fluids and joints. It effects all systems of the body. Using a delicate energetic palpation, the practitioner supports the body, mind and spirit of the being so they can re-balance themselves. We work with them without an agenda, always for their highest good. This 5 level certification program takes you through the entire body section by section so you will obtain a deep and thorough understanding of the canine from a craniosacral perspective. We’ll explore the dog-human relationship from a unique view through visionary craniosacral work. 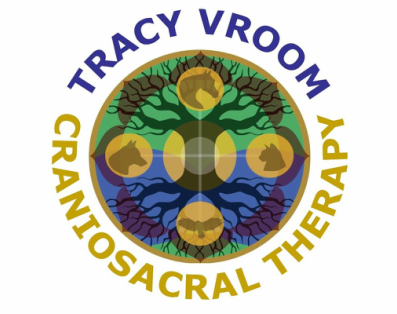 Visionary craniosacral therapy weaves shamanic technology with traditional craniosacral methods. This allows us to see what is actually happening with the dog physically and emotionally in that moment and locate primary issues effecting behavior and performance. We’ll work with dogs for direct experience and a deeper understanding. We’ll explore the dog as our master teacher, the speech of nature, the art of listening in expanded awareness, focus, sourcing, and the interface in relationships. The levels build on each other so must be taken in sequence. This is the beginning of your journey where you'll explore the history and theory behind craniosacral therapy from a visionary perspective utilizing the ancient wisdom of shamanic technologies. You'll learn a solid base of canine anatomy from the craniosacral perspective, how to feel the cranial rhythm on a dog, practical treatment protocols relating to the anatomy you learned and specific protocols for the dog(s) in your life. There will be a combination of lecture and hands-on work each day. This course is required to take any advanced courses. You’ll be perfecting your ability to feel the rhythm, learning the front end anatomy and protocol. We’ll delve into common pathology found in the cranium due to head injuries, birth trauma, and trauma to the front end from injuries, training mishaps & improper use of equipment. Anatomy: neck, shoulders, front limbs, back, ribs, more bones and sutures of the cranium, cranial nerves & unwinding of muscles. In this level you will learn the anatomy of the hind limb and protocol. We’ll talk about some common pathologies of the hind end relating to movement and protocols for restoring flexibility and balance. Anatomy: We’ll look at the bones of the hind end, muscles, connective tissues, nerves and the complex pelvic girdle. We’ll explore the systems of the body from a craniosacral perspective and learn how to work with them to restore balance. Anatomy: We’ll work with the cardiovascular, digestive, nervous, endocrine, immune/lymphatic, reproductive, respiratory and urinary systems. We will go deeper into the energetic and shamanic technologies of the work. This is an exploration of your unique gifts, working with energy, chakras, clearing, light frequencies, distance work, shamanic visioning, animal totems, stones and crystals. If tuition for whole program is pre-paid, there is a 10% discount. For grads of the equine cst program there is a 30% discount. And an added comparative anatomy segment. Ongoing private and group mentoring are available upon request.